We are coming on the home stretch and yes I still have a lot of stash to bust, but I can see the light at the end of the tunnel, or at least the top of my sewing station. I wanted to give you a few ideas for that last minute stash that you are in desperate need of busting before the challenge is over. The Chameleon Girls are offering a tutorial I really need to take advantage of. 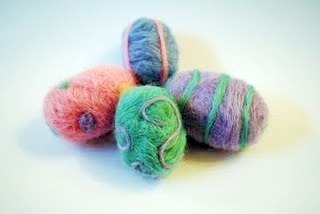 They created these adorable felted eggs. I LOVE felting, but alas more craft supplies to buy that I probably will just end up no using so if you have some felting materials join them in making these! Domestic Deadline makes me want to go out and buy a mens shirt so I can make this adorable Tunic Top. This looks so simple, but the results are adorable. And finally why am I singing "lollipop, lollipop, oh lolli lolli lolli lollipop" (off key of course). 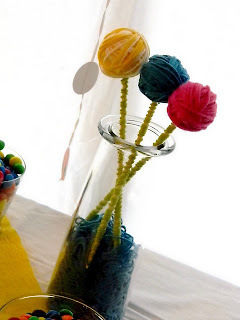 Well because Kimberly over at Bugaboo, Mini, Mr., and Me is sharing her tutorial to use up your extra yarn by creating yarn lollipops! We are on the home stretch and hopefully this will help you bust some more stash, open up more space, and craft your little heart out for these last few days of your stashbusting challenge! 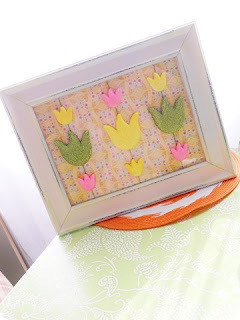 I am so excited that we make it this far and I can not wait to see the rest of the wonderful spring stashbusting projects my beautiful blogging friends have come up with.